NY Sea Grant | NYSG: What Is New York Sea Grant? What Is New York Sea Grant? Established in 1966, the National Sea Grant College Program promotes the informed stewardship of coastal resources in 33 joint federal/state university-based programs in every U.S. coastal state (marine and Great Lakes) and Puerto Rico (click here for U.S. map with all Sea Grant locations). The Sea Grant model has also inspired similar projects in the Pacific region, Korea and Indonesia. New York Sea Grant (NYSG), one of the largest of the state Sea Grant programs, is a cooperative program of the State University of New York (SUNY) and Cornell University, with administrative offices at Stony Brook University, extension administration at Cornell University in Ithaca, and extension specialists located in Stony Brook, Kingston, Oswego, Newark, Buffalo and New York City. Through NYSG’s efforts, the combined talents of university scientists and extension specialists help develop and transfer science-based information to many coastal user groups - businesses and industries, federal, state and local government decision-makers and agency managers, educators, the media and the interested public. New York needs Sea Grant... Our state, with 3,400 miles of widely varied coastline, is the only state in the nation bordering both the Great Lakes and the ocean. 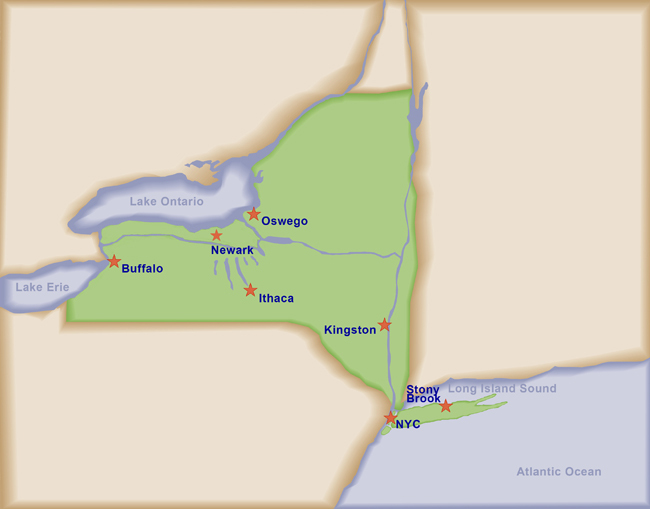 The Hudson, Mohawk, St. Lawrence and Niagara Rivers, Lakes Ontario, Erie and Champlain, Long Island Sound, coastal bays, New York Harbor and the Atlantic Ocean provide the state with unique economic, environmental and social advantages. More than 85 percent of the State’s nearly 20 million people live in one of those coastal regions. New Yorkers depend on our coasts for ports and marinas, trade and recreation, and their contribution to economic and environmental sustainability. New York Sea Grant is currently “making a difference” by supporting about 45 important research and outreach projects on issues such as shoreline protection, fisheries, aquatic invasive species, water quality, and harmful algal blooms. We support high-quality, university-based, natural and social science research that takes an unbiased look at priority questions. It combines scientific rigor with a real-world stakeholder view. Our technical peer-review process is very thorough and provides the foundation for NYSG’s scientific credibility. NYSG participates in several cooperative regional efforts. NYSG assists the Environmental Protection Agency Long Island Sound Study by managing their research grant program with Connecticut Sea Grant. NYSG and the Sea Grant programs of New Jersey and Connecticut have recently completed a cooperative social science research program to improve community understanding and response to coastal storm hazard information as part of NOAA’s Sea Grant “Coastal Storm Awareness Program” (CSAP). More on that at www.nyseagrant.org/csap. As part of the North East Regional Sea Grant consortium, NYSG has been involved managing social science research addressing coastal community resiliency and is currently managing research addressing ocean acidification. NYSG has also participated in cooperative extension and research with the Great Lakes and Mid-Atlantic regional Sea Grant programs. As a federal/state matching funds program, NYSG is accountable to its federal source of funding, the National Oceanic and Atmospheric Administration (NOAA) in the US Department of Commerce, as well as to the State of New York. Our Track Record… Since its start in 1971, NYSG has provided to date a total of over $142 million (funded via Federal Omnibus budget, NY State, Extension, EPA Long Island Sound, NYSDEC, Knauss Fellowships) for university research, education, and outreach projects; sponsored conferences, seminars and workshops on vital coastal issues; and made it possible for more than 650 students to get graduate school training. Towards the Future… With ongoing strategic planning and input from stakeholders and the research community, NYSG, with its partners and supporters is poised to advance the state of the art of research and management for the benefit of New York’s varied coastal environments and communities.